Throughout the 1990s and beyond, the film industry, armed with and emboldened by new Computer-Generated Image (CGI) technology, began to push even further the limits of violence, depravity, and shock value in the new mainstream cinema. Understatement, suggestion, or innuendo were replaced with glaring, often disturbing images of humans trapped in stomach-churning situations with serial killers, homicidal shunned lovers, aliens, and vampires. Even more cerebral dramatic films often suffered from poor scripting, weak character development, and loose plotting. Technology in camera motion and digital, non-linear editing empowered film makers to abandon static shots and "long takes" (a camera shot of long duration) for constant camera motion, short takes, and rapid-cutting of images at a mind blowing speed, ultimately contributing to the movie-goers' shortened attention span. I wonder if young theater patrons today would sit patiently through the classic scene in North By Northwest where Cary Grant waits for his connection in a lonesome prairie landscape where only a menacing crop duster plane can be seen in the distance? Who would revel in the shear beauty of the slow zooming shot of Ben Johnson (Sam the Lion) delivering his heart-wrenching soliloquy about a girl he once knew in Peter Bogdanovich's The Last Picture Show? 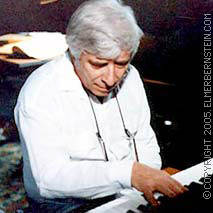 Clearly, in the last decades of his career, Elmer Bernstein had become weary of the shallowness and vacancy of ideas in some mainstream films and turned to artistic film makers making smaller movies or who still recognized and wanted to tap into his well of creativity, like Martin Scorcese, Francis Ford Coppola, and Martha Coolidge. Of this final chapter in EB's career, three film scores always come to mind as they reflect the sensitivity, facility, creativity, and dramatic insight Elmer exhibited with his musical voice. The high-water mark in Elmer's later works, this score for director Martin Scorcese is a success on so many levels; it perfectly evokes America's Gilded Age--the opulence and wealth of an idle upper class; it weaves in and out of the quiet deceptions, innuendos, and secret longings of its central characters; and it unsentimentally articulates the tragedy of people hopelessly snared by social mores and fears of familial abandonment and financial ruin. At first glance, the film, which is based on Edith Wharton's novel, would seem to be nothing more than an extravagant costumer, where people are endlessly amused by discussions on proper attire, ideal summer homes, or successful dinner parties--or smug criticisms on social class. Early in the film we observe Wayland Archer (Daniel Day-Lewis) gracefully follow protocol as he announces his engagement to May Welland (Winona Ryder). Every nuance of his performance suggests the proper gentleman, but Archer's veneer starts to crack as he becomes infatuated with May's cousin, the Countess Ellen Olenska (Michelle Pfeiffer). As soon as he begins to defend her unpolished social behavior and the righteousness of her intention to leave an abusive husband, Archer slowly finds himself being deftly manipulated by those in his family and social circle, which ultimately foils his attempts to follow his heart. Musically, I like to think of the score that accompanies this excellent film as the equivalent of Bernstein's Fifth. It's a rich musical tapestry with some wonderful themes. Mrs. Mingott. With all the pomp and circumstance of a queen's ball, this Johann Strauss-like piece richly personifies the eccentric and powerful Mrs. Mingott, whose decisions can alter the course of human events--as she holds court in her ground-floor living quarters, surrounded by family members, sycophants, and other "lapdogs." The first theme, in F major, is a softly elegant leitmotif that suggests there is a human side to the beneficence of this great matriarch. But Elmer knows better, and he uses a unison A-note phrase to modulate this piece to a second waltz, a magnificent theme in D major, to conjure up Mrs. Mingott's world of wealth and privilege where we imagine couples walking arm-in-arm along the boulevard or carriages bearing passengers to the opera house. This is a lovely piece of music and does bear a slight resemblance to Victor Young's Around the World in 80 Days, although I'm sure the 6-note phrase similarity was a subconscious influence. Van Der Luydens. One of the prettiest cues in Elmer's canon and one I play over and over on the soundtrack for this film. One of the first times the waltz is heard is after Archer appeals to the highest strata of New York society--the Van Der Luydens--to allow the snubbed Countess, whom Archer is falling in love with, to attend a regal dinner held in honor of a Duke. Bernstein's music follows in perfect synchronization to Scorcese's fluid camera motion as it takes in the dinner guests and a huge centerpiece of flowers (flowers are a recurring theme), inviting us to bask in this moment of refined hedonism, and we do. Archer and Countess Olenska's Love Theme. With this leitmotif, Elmer manages quite effectively to capture the unconsummated longing of the two clandestine lovers. Often played by the woodwinds and the Ondes Martenot, this theme carries a great counterpoint harmony played by high strings. The music explores the conflicted emotions of Archer, who desires the Countess for her beauty and modern thinking, but remains fearful of societal disdain for their indiscretions. The theme also alludes to Olenska's flirtations, which begin playfully but then hold Archer a prisoner in his own life. It's fortunate that Scorcese and Bernstein had a brief collaborative period, as it seems to have brought out the best in each. It's refreshing to see the director/co-writer delving into a period piece rather than another film depicting the criminal underworld. (Ironically, there is a kind of violence in The Age of Innocence, but it is expressed through words and disapproving looks, which can pierce the human heart. On the archery field, after May demonstrates her skills with a bow and arrow, Countess Olenska's husband says within earshot of Wayland Archer, "It's the only target she'll ever hit," alluding to her simple intellect.) And I believe Scorcese challenged Elmer to explore musical places he had not visited in a long time. It's a superior achievement for both. A well crafted legal eagle film with a steamy urban score by EB. The film is an engaging story of a young Memphis lawyer, Rudy Baylor (Matt Damon), who takes on an unwinnable case against a corrupt insurance company whose refusal to pay for an operation results in the death of the plaintiff's son. The scenes with Damon, his client, Dot (Mary Kay Place), and her dying son, Donny Ray (Johnny Whitworth), are especially moving, partly because they depict a realistically dysfunctional family burdened by poverty, alcoholism, and a powerlessness in the legal system. Francis Ford Coppola directs with atypical restraint, and the settings and individual scenes have an unvarnished, neorealistic look. Elmer must have relished this project because he reaches deep into his untapped resources to produce an underscore that is grungy, bluesy, and perfectly appropriate for a film set in Memphis, populated with seedy and morally ambivalent characters. The main theme, Sharks, gives us a swinging 6/8 time signature, Hammond B-3 organ through a rotary speaker, muted trumpets, and deep and low brass arrangements reminiscent of Walk On the Wild Side or The Sweet Smell of Success, only updated for the 1990s. Some have commented that the music doesn't reflect the musical language of Beale Street, but I say "no matter." EB composes to the characters and their situations in a city that seems permanently overcast, hot, and humid. As if Elmer waited for the movies to catch up with him again, the composer concluded his illustrious film music career with this stunning achievement. All the conditions were right: Writer/Director Todd Haynes wanted to celebrate the look of Eisenhower-era films depicting the lush, affluent world of the 1950s corporate husband and his perfect American home--while exposing the real human suffering of people trapped by social mores, racial prejudice, and homophobia. Haynes and his Art Director (Peter Rogness) and Cinematographer (Edward Lachman) needed to meticulously recreate the deep light and color saturation of films like Hitchcock's The Trouble With Harry, or Douglas Sirk's Written on the Wind and Imitation of Life. 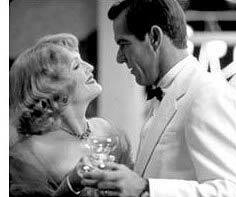 Plus, Haynes needed gifted actors like Julianne Moore and Dennis Quaid who could wear the facade of schooled respectability, but who could begin to show the cracks in their armor as circumstances and human desires begin to spin out of control. Finally, the director needed a composer who could evoke the 1950s melodrama, while remaining sensitive enough not to mock the repressed emotions of the characters. Elmer Bernstein was the perfect choice. Having honed his craft on films like Desire Under the Elms, Some Came Running, and From the Terrace, EB knew just the right approach to take with Far From Heaven's score. His solo piano theme, while reminding us of cocktail parties and piano bars, turns the melody into a plaintive cry for Cathy Whitaker (Moore)--the ideal middle-class wife, mother, and social butterfly who slowly begins to recognize the shallowness of her friendships as well as the undercurrent of intolerance for her husband's "affliction" and her own friendship with her African American gardener (actor Dennis Haysbert). This central leitmotif is a lovely piece of music that, like To Kill a Mockingbird, gradually swells into an orchestral wave that speaks to the characters' quiet desperation. Still, the theme is never maudlin, as it conveys emotions forged in the crucible of truth and beauty. We even get to hear the main theme arranged as a rumba at a dinner club where Moore and Quaid try to overcome the growing storm in their marriage. In the end, Elmer's score is rendered with the same artistic strokes as the film's rich New England autumn color and the simple but very naturalistic dialogue. A great film and a fitting swan song for one of the greatest film composers of the 20th Century. The era of the big symphonic score, inspired by the great European classical composers, has long since been over. Today, film music competes more and more with a cacophony of sound effects and is written in much broader strokes than ever conceived by the Golden Age of film composers. Rich counterpoint, harmony, and layers of beautifully detailed orchestration are no longer in vogue. Digital audio workstations, synthesizers, and sequencers have sometimes supplanted the lone composer hand notating his score or giving instructions to his/her orchestrators. Add to this the constraints of having to sometimes score a film in as few as 10 days to 2 weeks and you begin to see the necessity for a simpler musical palette. In the last 20 years of his career, Elmer spoke passionately and sometimes despondently about this shift in scoring approach, but he did recognize and champion some of the new musical voices in the industry, such as James Newton Howard and Bruce Broughton. And there are many strikingly talented composers working today, some of whom hearken back to that Golden Age, like Danny Elfman and the prolific John Williams. And it can be said that Bernstein himself was in part responsible for the gradual shift away from melodramatic scoring of the 1940s and 1950s to the more subtle approaches that he and his contemporaries applied in the modern age of filmmaking. Still, Elmer always knew the value of good melodic invention and its power when married to the images on a movie screen. Director John Sturges once remarked that he could direct an actor to look out a window, but Elmer's music could tell you what that actor was thinking or feeling. In an interview conducted for a book on film composing, Elmer once said (and I paraphrase) that the wonder of music is that the listener doesn't need to bring anything to the table. He or she doesn't need to have an intellectual understanding of it, a knowledge of how it is made, or even why it was written. The listener can respond to it purely on an emotional level. I think this is how I will always remember Elmer's music. Remember how it makes me feel when I hear it underneath the image of seven horsemen riding across the Mexican desert, or an American POW bouncing a baseball off the walls of a cell, or Boo Radley carrying Jem home to safety. Elmer Bernstein's music in and outside the context of the films for which it was written has enriched my life in so many ways. He was a giant. In researching my tribute site to Elmer, I gathered some remarkable statistics which prove beyond a doubt his enormous impact on the world of cinema. They also reveal that Elmer Bernstein represents the true bridge between the Golden Age of American film music and the Modern Age. Selected by Cecil B. DeMille to score the Ten Commandments, even though the young 34-year old composer had only been scoring films for 5 years. Scored three films for Frank Sinatra, including the landmark all-jazz underscore, Man with the Golden Arm, as well as Some Came Running, and Kings Go Forth. Scored seven John Wayne films, becoming the actor's preferred film composer after the death of Dimitri Tiomkin: The Comancheros, The Sons of Katie Elder, True Grit, Big Jake, Cahill: United States Marshall, McQ, The Shootist. Scored six films for Burt Lancaster, who often requested the composer for his films. Scored three Paul Newman films: From the Terrace, Hud, and Slapshot. Four of Elmer's most memorable scores were composed for films starring Steve McQueen: The Magnificent Seven, The Great Escape, Love With the Proper Stranger, and Baby, the Rain Must Fall. Composed for two films directed by critically acclaimed John Frankenheimer (Birdman of Alcatraz, The Gypsy Moths). Was a favorite composer of highly regarded director, George Roy Hill, who used the composer on five of his films. Composed a rip-roaring, New Orleans-charged theme for Walk on the Wild Side played over the main title sequence of a cat prancing through an alley--the best part of the entire movie. Had a #1 hit song with Glenn Yarborough covering "Baby, the Rain Must Fall." Wrote what many regard as one of the 10 best film scores of all time, To Kill a Mockingbird, for the film directed by Robert Mulligan and staring Gregory Peck. Music critics have called it one of the finest examples of film music that reflects the world through a child's eyes. Composed at least two themes that most American film buffs can sing note-for-note--The Magnificent Seven and The Great Escape march. Created musical archetypes for the modern Western, the Southern melodrama, the American war film, and gritty urban dramas. You can still hear his influence in many modern film composers. Had a second career of sorts, finding new audiences with his scores to films directed by John Landis and other comedy directors of the 70s and 80s. Film scores included Animal House, Airplane!, Ghostbusters. Scored the background music to Michael Jackson's Thriller video--one of the MTV era's most famous and popular music videos. Wrote a terrific score for Francis Ford Coppola's The Rainmaker, starring Matt Damon. Weary of shallow, big-budget films in the 1990s, turned his attention to smaller independent films, which focused more on humanistic stories. Scored three films staring Daniel Day-Lewis, including My Left Foot and Martin Scorcese's The Age of Innocence. Nominated 14 times for the Oscar. Always touted the contributions of his frequent orchestrators, Leo Shuken and Jack Hayes, and made sure they received credits on Bernstein's soundtrack albums. Is one of the most recorded film composers of all time, with 120 soundtracts on LP and CD formats at last count.